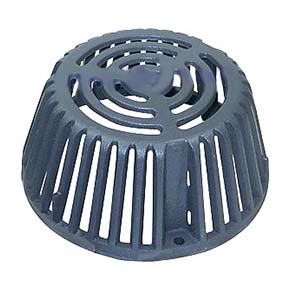 PRODUCT: 10" Cast Iron Replacement Drain Dome / Strainer. Watts D2 3-bolt Style, 9-5/8" OD x 4-1/2 High, Epoxy Coated Cast Iron. Replaces most popular 10" size strainers. Price/Each. DESCRIPTION: 10" Cast Iron Replacement Drain Dome. Watts part D2 / Marathon Part #C1-3080. 9-5/8" OD Drain fits Watts RD1 / RD10 drains (Dome 2D), and many other popular 10" diamater roof drains. Bolt-Bolt: 7-1/2" bolt-center to bolt-center. 10 inch Black Polyethylene Drain Dome / Strainer/ Grate. 9-1/2 OD Base X 4-1/4 High with 3 Bolt Mounting Holes. Replaces Popular 10 Inch Plastic Strainers / Domes. Price/Each.